The Fog Fury 3000 is a 1500W professional fog machine that can be controlled using an ADJ DMX controller. It has a high performance pump, Electronic Thermo Sensing technology to maintain optimum temperatures, as well as many other automatic and controllable features. The Fog Fury 3000 produces 21,000 cubic feet of fog per minute. 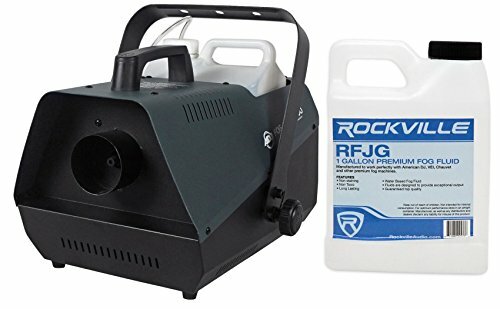 Rockville RFJG Gallon Fog/Smoke Juice Fluid For Chauvet American DJ ADJ Machines. 1 Gallon. Non staining. Non Toxic. Long Lasting. Water Based Fog Fluid. Authentic Rockville fog juice. Rockville Fluids are designed and tested to provide exceptional output. Lower end brands make bad quality fog juice which can damage your equipment, only use Rockville fluids!